A couple of weeks ago we brought you the Top 5 Snorkels on the Market and, carrying on with the theme, here’s another gem of the snorkeling world – the Ninja Snorkeling Mask by H20. So, if you are planning a tropical getaway, you are definitely going to need the Ninja Snorkeling Mask for quite a few reasons. 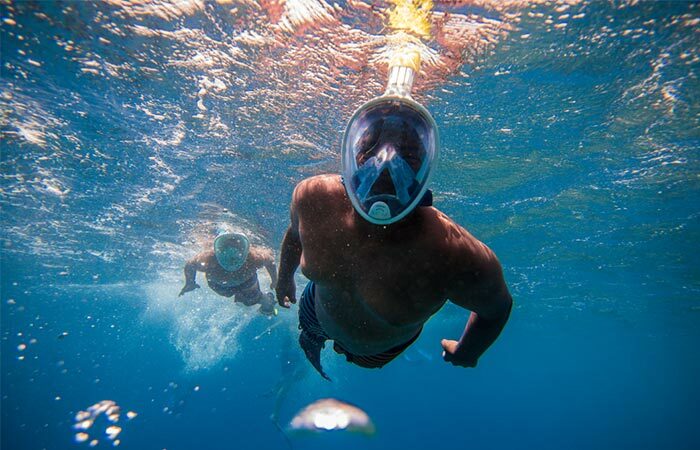 If you have already tried a snorkel and mask duo set, you’ll probably found that it can be pretty cumbersome and feel quite unnatural to breathe solely through your mouth. This is what sets the H20 Ninja Snorkel Mask apart from the rest. By incorporating a full face design, the Ninja Mask completely covers both your mouth and your nose for easier, more natural breathing. By designing the snorkel in this manner, H20 managed to drastically reduce the possibility of fogging up by using an innovative breathing mechanism; when you breathe in, the incoming cool air flows over your face from the top downwards with a one-way valve and when you breathe out, the air escapes through specially designed channels in the side of the mask. This circulation keeps a constant temperature inside the mask that deters your mask from fogging up. By using a water-stop valve, you can even take shallow dive without having to worry about water entering the mask. A full-face screen also gives you unhindered viewing pleasure.